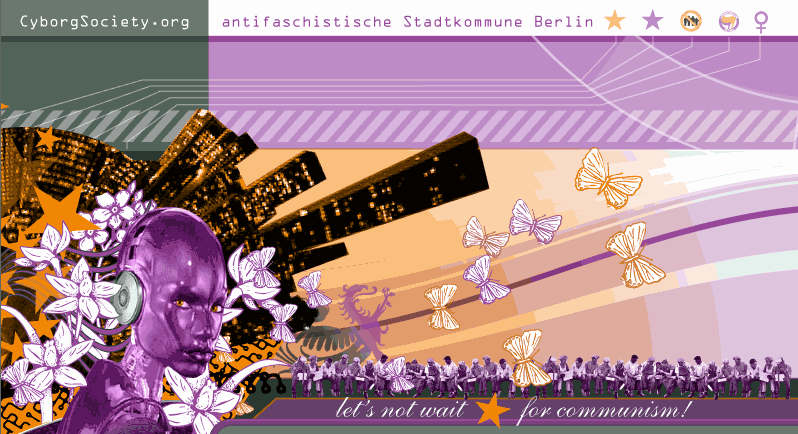 The antifascist urban commune exists in Berlin since early 2006. We are an urban commune project aiming at the establishment of a decentralised commune, running at several places. Therefore we develop a form of organisation which enables transparency and plannability of all its parts through internet communication. Because of this we want to create a dynamic organisation with heaps of RELATIVELY autonomous parts. We demand from our communauts to share leftist basics (like the disaffirmation of nationalism, racism, antisemitism, sexism, esotericism...). Based on this, we aim to fulfill the needs of all participating interests - even without a common denominator or political masterplan. But this should be our basis also for our personal political ambitions. We want a better life without bosses and nuclear family, with collective organisation of everyday's life. And we are looking for people who want the same. We also do meetings in English language. Sorry, most of the theoretical texts are not yet translated!